If you blog (or even if you don't), you probably notice that some comments or messages are just pure junk. You can tell that the person (or maybe some kind of auto poster) left a totally unrelated note on your space. This week Alisha left a note to check out some Wowzio widgets. She said that her message was not spam. Yeah. Right. That is a good way to get around it. I'm Southern (as good an excuse as any), so I check out notes folks leave even if they don't sound on the level. This was a longish note though, and I thought maybe . . . Normally I don't even like widgets or any movement on a web page. That running monkey. Oh man. That drove me nuts. When about com had the bobble line, I could not bear it. So, I was thinking that even if these were good widgets, they probably were not the kind of thing or things I'd be interested in. I did click over to see the widgets for Barbecue Master, and WOW. I guess that's why they call the company wow-zio. I read all the pages on the site and looked at those widgets, and I decided, "Yes. I think those would be helpful to visitors." 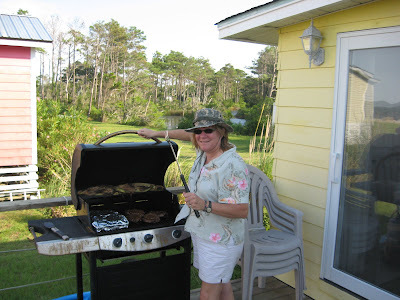 If you're checking out my Barbecue Master blog, you can look over to the right and see some rotating photos. Those are the photos with my most current posts along with titles, so you have some idea as to what the blog post is about. If you click on a photo when it's up, then you go right to that post. Maybe you come here to read about corn, but see some burgers that catch your eye. You can easily click and find the burger post and not spend loads of time searching. The second widget I added (they have a few) was the one that lists the locations of visitors. It's not your home address or anything - just the country and/or state. I don't suppose that's critical, but I enjoy seeing the areas of the world and country where others are visiting from. I hope other people reading Barbecue Master also find that interesting. I hope all ya'll visiting enjoy the widgets. You have Wowzio to thank, because I'm sure it would take me a lifetime to build those. Also, if you blog, check out Wowzio. They don't charge bloggers. You just visit and see what they have to offer and then can add the widgets or not. I think the widgets are especially nice for food bloggers, because it's nice to have some way to showcase the various foods and recipes. I might not think to go back through your blog posts, but if I saw something yummy, I'd be likely to click and see how to make a good looking dish. Enjoyed your post. I will be back to read more! Thank you for stopping by. If you enjoy food blogs, you might enjoy Food Buzz http://www.foodbuzz.com It's a social space but only foodies. I am new there at Food Buzz, but it's neat to find new cooking blogs of all types. I'm signed up there under my name - Cyndi Allison. Say "hi" if you visit. I also have a web page of my own now. That's new too. That's Yes You Can Grill http://www.yesyoucangrill.com I have quite a few recipes up already and adding almost every day. Hey there, saw you on Foodbuzz and decided to pop in. I like the new widgets, the rotating pictures are especially nice. Love your pics, btw. See you around Foodbuzz and happy grilling! Thanks for stopping by! Food Buzz is fun, and I'm finding loads of great people and blogs. My town shows up as the closest bigger town. This one only has 800 people, so I guess they don't keep track of it. But Brooklyn? I'd think that would register. I really appreciated this post. I got one of those comments, too, but didn't look to see if it was on the level. Also love your site, Yes You Can Grill. I have created a demo on how to embed wowzio widgets to your blogs. Cool article you got here. I'd like to read more about this topic. Thnx for giving that material. I want not acquiesce in on it. I think polite post. Expressly the title attracted me to read the unscathed story. I've been searching in google for some items and occasionally found this barbequemaster.blogspot.com site. I don't have much to add to the conversation, but I'm right there with you. Your post said exactly what I have been thinking. Good to see you posting again.